The Duterte administration should redefine itself despite the high approval rating it got from pursuing its ruthless campaign against drugs during the first 100 days. The challenge was made by the Church-Labor Conference (CLC), an aggrupation of labor and church groups in the country, in a rally held at the Mabuhay Rotonda this morning, on the occasion of President Duterte’s 100th day in office. October 7 also marks the celebration of World Day for Decent Work. 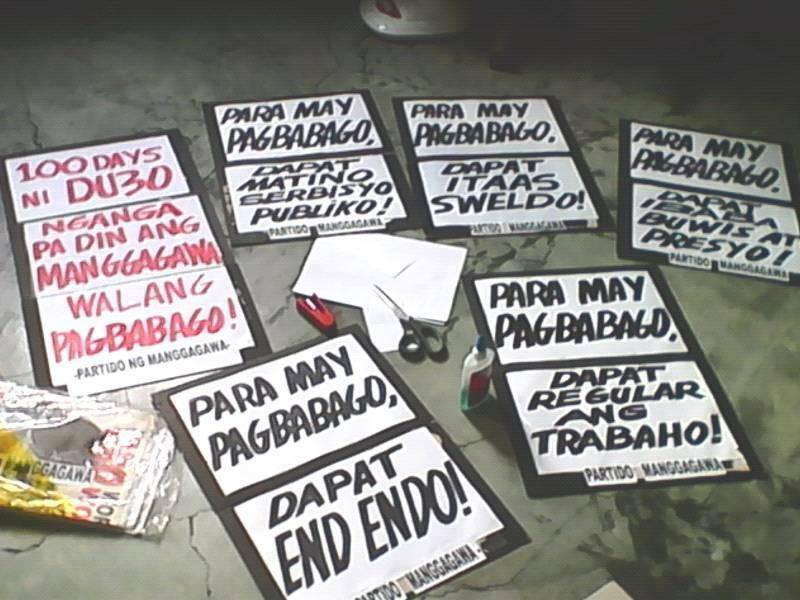 In Cebu, the chapter of Partido Manggagawa (PM) echoed this call. “Ang kahirapan at adiksyon ay magkarugtong na problema. Ang malawakang patayan at ang kahandaan pang pumatay ng 3 milyong pusher at adik ay hindi solusyon sa kahirapan. Ang kailangan ay bagong patakaran at konkretong hakbang na maghahango sa 26 na milyong Pilipino mula sa kahirapan, magbibigay kabuhayan at regular na trabaho sa 40 na milyong manggagawa, at buhay na may dignidad para sa lahat,” said PM-Cebu spokesperson Dennis Derige. One of PM-Cebu's leader and organizer, Orlando "Ka Lando" Abangan, was shot and killed last September in a vigilante style killing. His killing remains unsolved. PM national chair and CLC co-chair Renato Magtubo said the next five and a half years will be more challenging for the Duterte administration amid the sharpening contradictions between the contending classes inside and outside his administration in dealing with other social programs. He cited as an example the strong opposition coming from local and foreign business groups against workers demand to finally end the policy contractualization and the realization of the living wage principle enshrined in the constitution. “Sa manggagawa ay simple lang ang depinisyon ng pagbabago. Wala nito kung nariyan pa rin ang endo at mababa ang sweldo. Wala nito kung mananatiling untouchable ang mga gaya ni Lucio Tan, Henry Sy, at iba pang endo lords,” added Magtubo. 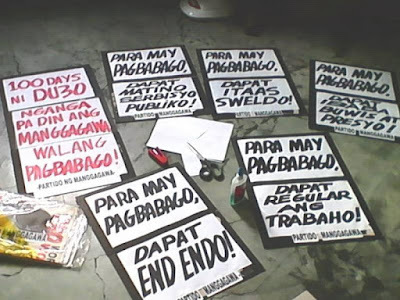 Labor groups were all opposed to the win-win solution on endo being proposed by the Department of Trade and Industry (DTI) which promotes regularization outside of the principal employers but to the third party service providers such as manpower agencies and cooperatives. The group is also opposed to the planned imposition of regressive taxes to replace revenue loss resulting from the removal of VAT exemptions from senior citizens and the lowering of income taxes for corporations and individuals in the higher tax brackets.